Companies based within the EU, that are VAT registered, can receive orders at 0% VAT. The IP Power 9258DS can be controlled over a TCP/IP network using generic Ethernet or Web browser. Each independent outlet can be switched ON, OFF or Booted (OFF- delay-ON). The IP Power 9258DS can supply up to 2x10A/240VAC Power - 10A per two sets of four socket. The IP Power 9258DS uses international standard IEC 320 inlet/outlet connectors that make it easy to use anywhere in the world. You can select the approprite IEC cables and adapters from the available options on this page. IP Power 9258 uses international standard IEC 320 Inlet/Outlet connectors. You can select the cables and plugs that are suitable for your application and country. Option 1: 10A IEC mains lead can be purchased to connect IP Power 9258 to a 220/240V mains power outlet. 2M cable, CE, BS1363/A and KEMA approved. 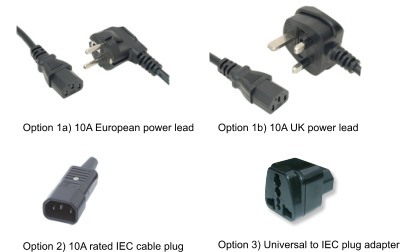 Choice of a 3-pin UK plug or a Schuko Euro plug. Option 2: To connect an appliance to one of the four sockets on IP Power 9258 the IEC cable plug can be used as a replacement for a standard three-pin mains plug. The IEC cable plug is rated at 10A/250V, has a reversable clump to suit various cable sizes, is fitted with pillar terminals, captive contact pins and cover screw. Shurter part number 4322.0000. Option 3: The universal IEC plug adapter can be used to directly plug in a UK, Schuko/Euro or USA type plug into an IEC socket on IP Power 9258. This product can be used in conjunction with the Omnima Embedded controller SKU16140. The embedded controller can be set up as a DHCP server to connect IP Power to the Internet. The embedded controller can also be programmed to turn the power switches on/off or change the timer settings by using http post/get requests sent to connected IP Power devices.